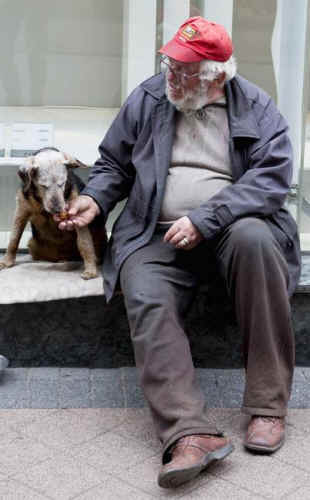 The mutual dependence among animals and their homeless persons is profound and real. Public agencies should review, update and create policies that support the human-animal homeless unit regarding housing, transportation, healthcare, veterinary care, and job-seeking services. The pets can be beneficiaries as well. Wayne proudly showed me Gonzo’s mulepack-style saddlebag designed for dogs. A homeless support program gave it to him. Gonzo likes to carry his own things, Wayne explained, because it gives him a sense of purpose. Many a parent has spoken similarly of a child and her backpack. But Wayne was also noting the contrast between Gonzo’s life on the street and the life of a domiciled dog. Most of us must leave our pets home alone for as long as eight to twelve hours a day. Gonzo is with Wayne at all times and has the benefit of constant interaction, socialization and enrichment. According to the U.S. Dept. of Housing and Urban Development (HUD), there were roughly 578,000 people homeless on any given night in January 2014. However, roughly 3.5 million will experience homelessness at some point within the year. The National Coalition for the Homeless estimates homeless pet owners as 10% of the total homeless population. In some areas, social service providers, including the not-for-profit, Pets of the Homeless, put the figure closer to 25%. he estimates vary because homeless pet owners constitute a hidden population. Some are secretive for fear of their pets being confiscated. And, because pets (especially dogs) are not allowed in most shelters, homeless guardians do not appear on counts. The number of animals with homeless persons is still staggering: 350,000 to 875,000 of those experiencing homelessness within the year have pets. Pet ownership can also be a barrier to support services. Most healthcare facilities, public transportation, shelters and other housing services do not permit pets. In simple terms, this means those with pets are not able to see a doctor, participate in job-finding services, ride a subway to seek support, or stay in temporary housing (including motels). Researchers report that homeless, particularly youth, refuse housing if they must be separated from their animals (Rhoades, Winetrobe and Rice, 2015). This mentality does not stray far from domiciled citizens. Most of us would rather accept less-than-ideal circumstances than be without our animal companions. The domiciled accuse homeless persons of keeping pets to gain sympathy when panhandling. Some people even offer to buy the pets, ignoring entirely the human-animal bond may be more important than money. The worst, of course, is many homeless live in fear of their pets being confiscated by the authorities. Wayne suggested to me the NYPD is eyeing homeless youth and their animals with increased vigor. For her book, My Dog Always Eats First: Homeless People & Their Animals, Leslie Irvine formally interviewed seventy-five homeless pet guardians around the country. What she heard echoed my own experience talking with Wayne and others like him: “my dog eats before I do,” and “when I don’t have any money sometimes for food, I’ll give them what I’m eating and go without food; I won’t let my animals go hungry.” They often describe how their animal is cared for better than most domiciled pets. [F]ocuses on coordinating pet food and supply donations from more than 260 sites across the country, arranging free emergency veterinary care, wellness clinics for nonemergency care like vaccinations and neutering or spaying services and, most importantly lobbying efforts to allow homeless shelters to let pets join their owners indoors. A NYC-based ministry, called Collide, focuses on supporting homeless youth and their animals in the East Village and Lower East Side. It is important that service agencies recognize the strong bonds between homeless pet owners and their companion animals. 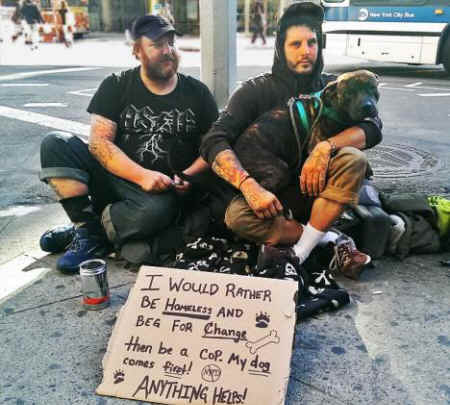 Ideally, agencies serving homeless pet owners would consider the homeless person and his/her pet to be a unit and strive to house and serve the unit, even at healthcare facilities. And in case you wondered about Wayne’s traveling partner, Michael (left in the photo above), he “retired” his companion dog to a family member’s farm. He believed it was getting too old to live comfortably on the street.